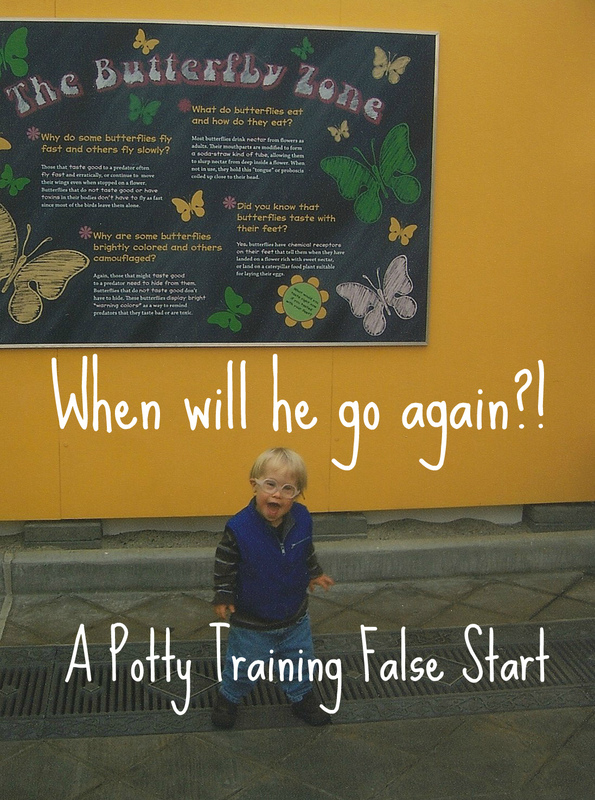 I get potty training questions a lot, like: "How and when do I start potty training?" Not, "When do I start potty training AGAIN?!" ﻿﻿Jessica wrote me: "Last summer [my son] was really interested in potty training and for a while he would pee in the potty every time.... As it got cold he lost all interest in the potty and would not go at all.... I am waiting for him to show interest in it again. From time to time I ask him if he would like to pee in the potty always the answer is no.... I appreciate any tips on potty training as well. Thanks for all your help." Did your child have a false start recently? You can wait until he shows interest again, but there is no predicting when that will be. Read potty books together, that is nice to do while you are waiting (and it makes you feel like you are doing SOMETHING). One of my mom friends accidentally used jelly beans for rewards! She rewarded her son one day for trying, with a jelly bean from a tub she got as a gift, and he never forgot it. He insisted on getting one every time he TRIED and he'd try ten times a day but never go--ha! So if you use this type of reward, have them brush their teeth, but make sure it is for GOING not trying! Most experienced toddler teachers will say the only way to do it is to put them in underwear all the time. Hmmmm... That makes it a question of: "When are YOU ready for potty training (again)!" If you can put your child in pull-ups, that gives him practice to pull it on and off. And they make pull-ups that allow the child to feel wet, but don't use them at night as they hold very little! Plastic pants are also a good choice, if you can wash them all! Here is a list of my son's all-time FAVORITE potty learning DVDs and books we used at home: Everyone Poops , Potty Power DVD , It's Potty Time DVD , Where's the Poop , A Potty for Me! , The Potty Book - For Boys , Potty Time , and It's Potty Time-Boys . Want more toddler Montessori? Click here to read more of my posts! * You might also be interested in my Montessori in the Home for Infants and Tots Birth to 24-Four Months Old ebook here! * Do you want to implement Montessori in the home or daycare? Learn about my affordable online Montessori for birth to nine!